Summer means friendly backyard barbecues, relaxing beach days, and, of course, memorable trips. Luckily, no matter where you travel (or don’t), vacation can be wherever you take a good book. That’s why this year, Tips on Life & Love is embracing the idea of a BookCation! And what better way to celebrate than with a special sweepstakes?! Feeling lucky? Visit thediscoverer.com right now to enter for a chance to win! Plus, don’t forget to share your #BookCation photos with us–we’d love to see what you’re reading this summer. Use the hashtag and tag Tips on Life & Love on Facebook. 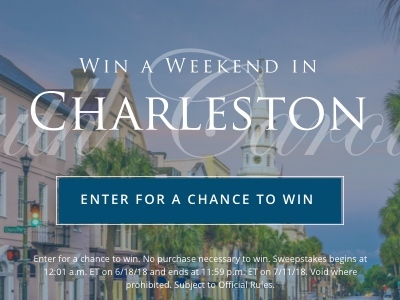 Share Sweepstakes: Enter for a Chance to Win a Trip to Charleston!